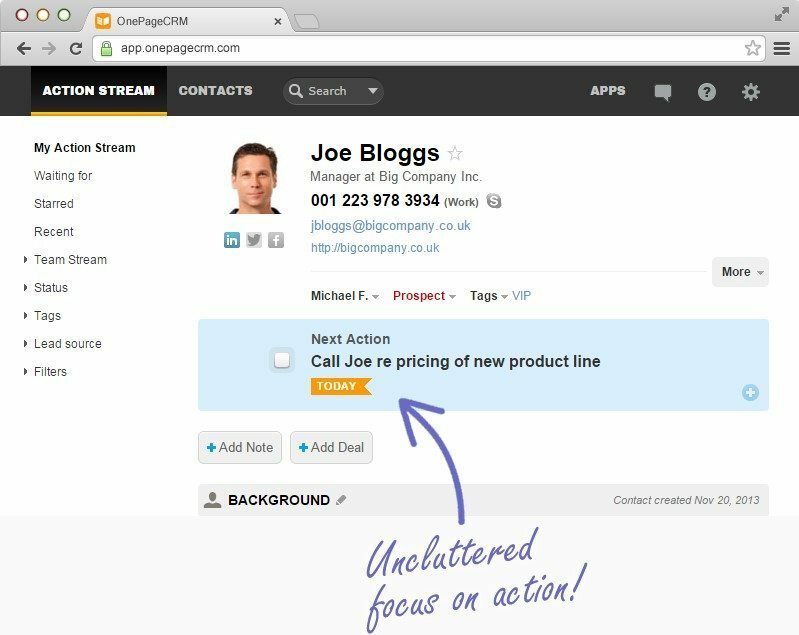 The simple and easy to use dashboard of OnePageCRM streamlines the sales process by putting all the information you need in one location. It organizes your contacts and prospects in a timely fashion, putting the most time urgent at the top. This allows your team to easily manage sales and keep track of progress. Additionally, this system encourages ongoing progress when interacting with clients. As soon as you finish one objective it prompts you to set up a new objective with that client – this prompting of the next call to action often keeps you on top of your sales and stops you from falling behind or losing clients. 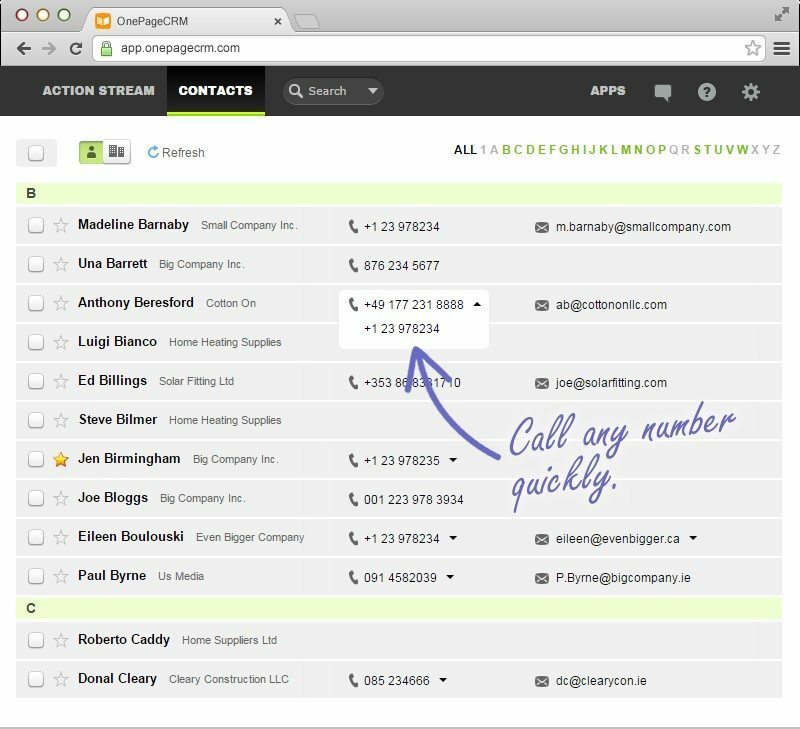 OnePageCRM offers a way to manage all your and your employee’s contacts in one, organized place. 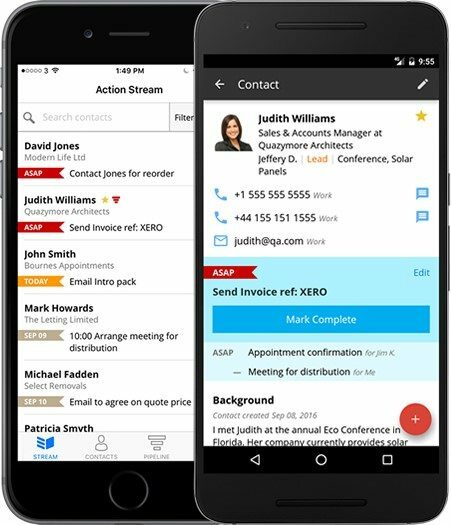 Companies often have different contacts in individual phones or email accounts and OnePageCRM allows you to share your contacts and merge duplicates, so all your employees can easily access any contact they need. The innovative technology of OnePageCRM allows you to capture new lead information and organize it in less time than ever. 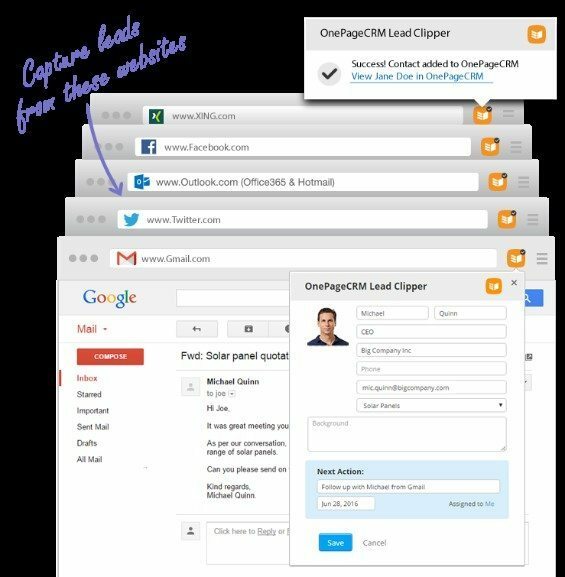 OnePageCRM has a tool that allows you to capture details from emails, webpages, and social media regarding potential leads and adds them to your OnePageCRM. OnePageCRM makes it easier than ever to retain information regarding leads. 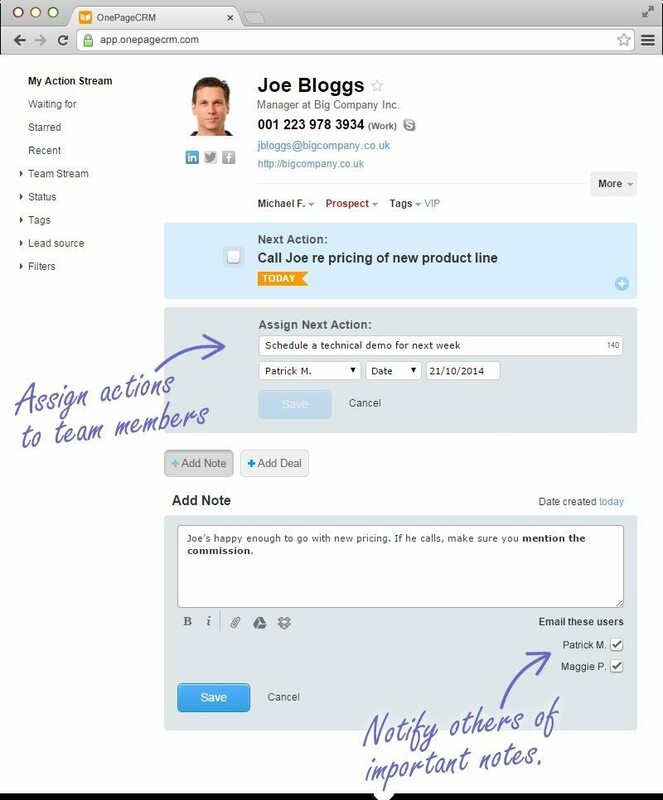 The OnePageCRM software lets you and your team communicate in an effective manner so that you can manage sales in a more efficient way. When you accomplish an action you can inform others or can assign a task to others who will be notified via email. This collaboration will allow your team to be more effective and take on more clients and track progress. OnePageCRM integrates various apps that your company probably already uses. These tools include communication tools like MailChimp, lead generation tools, and financial tools. This means that OnePageCRM can work flawlessly with your other business systems and only increase your company’s productivity. Additionally, OnePageCRM has a mobile app that allows you to do all of this from your phone while on the go. 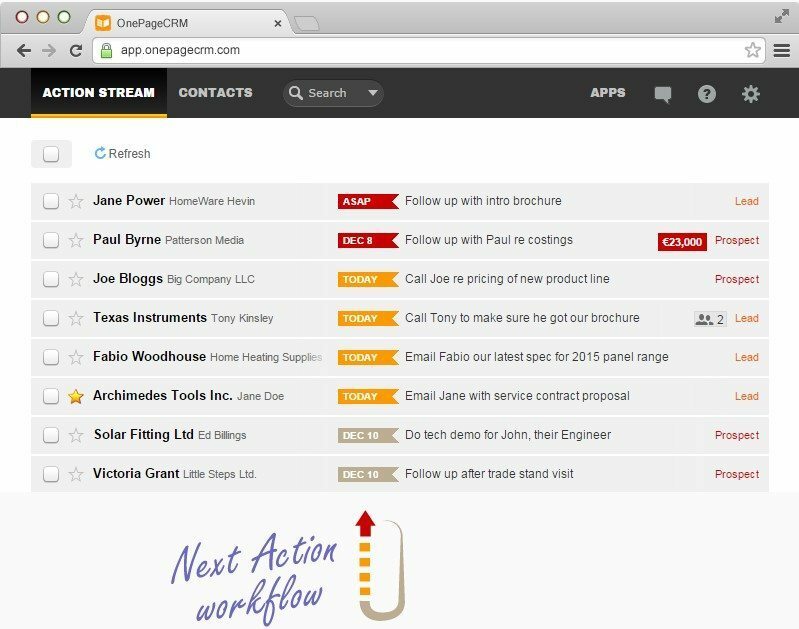 In general, OnePageCRM will allow your company to streamline productivity and increase relationship management efficiency. If your company is interested in OnePageCRM then you can try a free trial today and read more on their website.